2. Let it soak in a bowl of milk for 2 hours. 3. Drain it and keep aside the milk. 4. 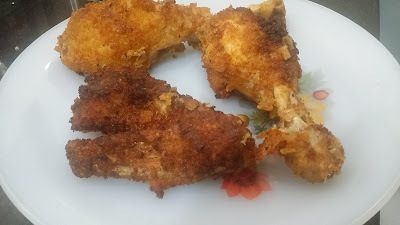 Coat chicken with salt, black pepper, chilli powder, garlic ginger powder. 5. Steam it for 30 minutes. 6. Meanwhile, in the milk add 1 egg, wheat flour, corn starch. 7. Have a separate bowl of breadcrumb. 8. After 30 minutes, dip chicken into the milk mixture, followed by bread crumb. 9. Deep fry it in 3/4 covered with hot oil.